Disney aficionados—and, really, movie buffs in general—can now have instant access to a large number of titles in Disney’s library with a new cloud-based service, Disney Movies Anywhere. Launching Tuesday and available in tandem with iTunes, the service lets you easily build up your personal collection of movies from Disney and its Pixar and Marvel affiliates; you can then access those movies through an Apple TV, an iOS app, or any Web browser. Disney Movies Anywhere’s adaptable ecosystem refers to its ever-changing variety of content and its future expansion to other partners and platforms. At launch, Disney Movies Anywhere syncs solely with iTunes, but Voris explained that the service would potentially support other providers down the road. As for content, you’ll find no shortage of movies to choose from: The service features 420 titles to start, along with several clips and bonus features exclusive to Disney Movies Anywhere. While entire movies must be bought individually, the service itself is free to use; users can view movie trailers and exclusive content for free as well. Build your collection and watch your movies from virtually anywhere. To sign up, you need both a Disney account and an Apple ID. 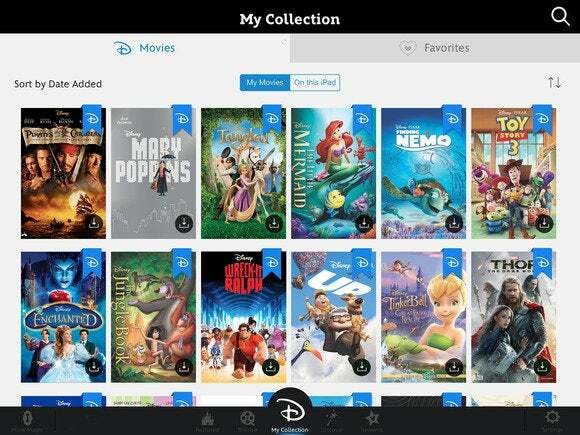 If you’ve created an account for any other Disney site—like a theme park, the Disney Store, or Disney Movie Rewards—you already have a Disney account; if not, you can create the account through the Disney Movies Anywhere app for iOS, through iTunes on Apple TV, or on its website through any browser. Disney's iOS app has a similar look and feel to Netflix Instant, which is a good thing: It feels very familiar and easy to use. Titles are sorted based on featured categories, like New and Upcoming, Award Winning, and All-Time Favorites. You can also do a search by title or keyword, or browse based on genre (like comedy, action, and of course, Disney Princesses). Movies you already own have a blue badge on their thumbnail image. Tap on a thumbnail to learn more, watch the trailer and other free extras, or to mark it as a favorite. You can, of course, buy the movie directly through the app; it will store on both your Disney Movies Anywhere account and iTunes. To see all of your movies, tap My Collection. What if you already own a hefty collection of Disney flicks? If you’ve purchased any hard-copies of Disney movies in the last few years, your movie probably came with a digital download code, which you can redeem and store on your Anywhere account. If you already redeemed that code or bought Disney movies through iTunes, then those films will automatically show up in your account when you link it to your Apple ID. (Unfortunately for hoarders like myself, you can’t up-convert your sweet Disney VHS collection that you’ve had since you were a child.) Disney Movies Anywhere also syncs with Disney Movie Rewards, a points-based system, which can earn you discounts on future purchases. If you'd prefer not to take up precious space on your iPad with the adventures of Woody, Ariel, Tony Stark, and the rest of the Disney/Pixar/Marvel gang, you can opt to stream your collection over Wi-Fi. You can simultaneously stream movies on two devices at a time, connecting up to eight devices per account. 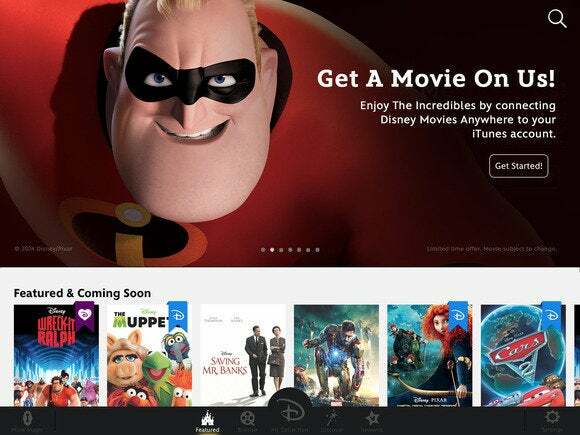 Disney Movies Anywhere is available now; you’ll get a free copy of Pixar’s The Incredibles for a limited time upon signup. The accompanying iOS app is free and available for the iPhone, iPad, and iPod touch.